Radiant floor heating is the lowest energy consumption system, because of the low temperatures at which it works and due to its caracteristics, it matches up perfectly with Solar thermal energy. The heating is clean, silent and invisible, since it consists of hot water running through underground pipes. This type of heating is the one that works the best with solar thermal energy and the one that has the least energy consumption. It is also the healthiest system, so much so, that it is recomended by the World Health Organization (WHO). Radiant floor is made from a pipes net stablished under the floor of the house. Temperature of water inside is moderate, about 100ºF, unlike radiators, which need a temperature of about 175ºF. Thanks of the distribuition under the floor, the right gradient of temperatures for human body are reached, keeping the feet warm and the head cool. This gradient of temperatures promotes energy save. With conventional heating, warm air tends to go to the cealing, despite the need of heat is where we are, right over the floor. Heating the surface of the floor, the need of heat is covered without heating unnecessarily the cealing and saving energy costs. Solar collectors cannot generate solar hot water everyday because they depend on the weather, so a boiler or a heat pump is needed as an auxiliar system for the facility. Solar energy can be used not only to generate solar hot water, but also to serve as auxiliar system for domestic heating in winter, what means big energy costs saving. The lack of room inside the building drived to seek an alternative location for accumulator. This was then installed behind collectors self, in horizontal position and perfectly isolated. Radiant floor is used to condition during the whole year, working as a heating system in winter and as a cooling system in summer. This system is combined with a heat pump and with a dehumidifying system, to avoid condensation inside the house. Solar system control: it regulates temperature and working of the whole system. 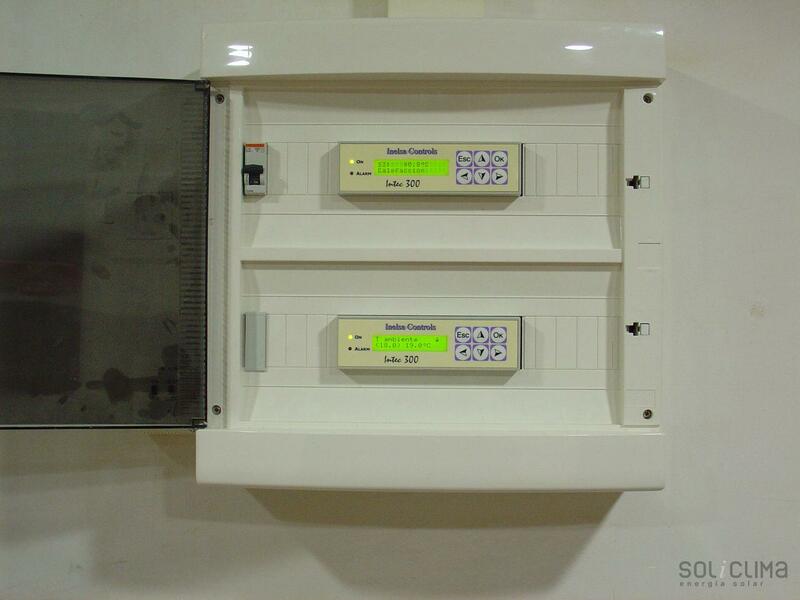 This devices can reach a high level of sofiscication, being able even to send a mail when it detects a system failure.